Managing Projects as Investments: Earned Value to Business Value (2014), by Stephen A. Devaux, represents a great leap forward for the project management (PM) discipline. 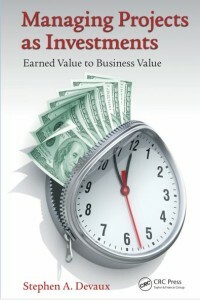 While the title may at first glance seem to blend in modestly with the usual PM fare, Devaux is challenging us to pay closer attention—in short, by showing us that established concepts such as “earned value” don’t actually answer any questions about business value at all. To borrow from one of the book’s many enlightening examples, imagine that an immunization program is launched, and has as its main objective to save as many lives as possible from a deadly virus that has thus far infected very few people. Imagine further that this program is blessed with the best PM and team, the most supportive stakeholders, an ample budget, and a well-understood scope that can be delivered within a realistic schedule. Suppose that half-way through this very well-run program, we find ourselves comfortably ahead of schedule and nicely under budget, but learn that the rate of infection has accelerated dramatically, far worse than projected, and is quickly becoming a pandemic. In this case, our earned-value metrics tell us that everything is going swimmingly, because those metrics are blithely ignorant of how drastically the value side of the program’s equation has changed. Our heroic PM may quickly offer up options for accelerating the schedule further by a few days, while keeping within scope and budget constraints. Will this acceleration help, or will it be too little and too late to be of high impact? Suppose for the sake of argument that it won’t help, but analysis shows that an additional 2 weeks of acceleration will save 50,000 lives, and an additional 4 weeks of acceleration will save an additional 25,000 lives (so, 75,000 total). The only catch is that we must go well over budget to achieve either scenario—the 2-week acceleration is projected to cost an additional $10M, and the 4-week acceleration option is far more costly, at $50M. Which option should we pick? Most of us would say that the $50M over-budget option is well worth saving those additional 25,000 lives, even though the cost per life saved is much higher than the $10M over-budget option. But what if we just don’t have the $50M, or can’t mobilize the funds fast enough, and the $10M of additional funding is all we can expect? Through analysis, suppose our heroic PM learns that we can cut program scope—specifically, the immunization training project—and thus accelerate things those additional two weeks, saving those additional 25,000 lives. The only downside is that a lack of training is expected to result in 1,000 lost lives due to some improperly administered immunizations, but the math is clear—we can save a lot more lives by cutting the training program than by keeping it. 1. The binary “success-or-failure” thinking that prevails in assessing project performance is shortsighted, as is the singular emphasis on delivering within planning constraints. 2. We PMs need much more than heroism to deliver outcomes that maximize value—we need to understand how every activity on the critical chain¹ affects the value that the project is expected to deliver. While the immunization program example is a dramatic one, the value considerations that it highlights are everywhere in the PM world, and are in fact central to any effort to maximize the return on any project investment. Furthermore, the associated tradeoff concepts are based on longstanding PM techniques and plain common sense. Unfortunately, the practice of making such informed tradeoff decisions is far from common, and that is precisely what Mr. Devaux seeks to change with this wonderfully illuminating book. ¹For the purposes of this discussion, assume that the critical chain is the same thing as the resource-loaded and leveled critical path. Copyright © 2018 Fortezza Consulting, LLC. All rights reserved.